Start your day with a hearty spread! Wake up to a choice of delicious buffet breakfasts. Indulge in an intercontinental breakfast at RISE Restaurant, savor a morning meal with a view 200m above the bay at Sky on 57®, or tuck into a traditional breakfast in Chinese surroundings at Jin Shan. From the indulgent to the authentic, there’s now more reason to get up early. 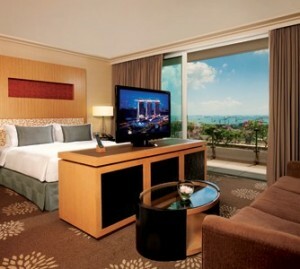 a stay in a Deluxe or Premier Room. Sky on 57 or Jin Shan. Please note the Bed and Breakfast Package has special Terms and Conditions. Price does not include 10% services charge and 7% GST.